This story was an exercise in restraint. 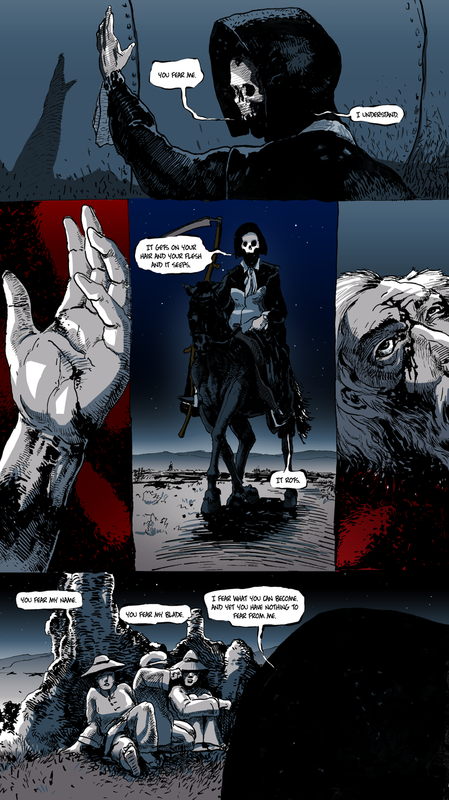 Hellrider Jackie is, undoubtedly, a dark character and, given what she does in this story, it could have been a disgusting story to tell. As you will read in Josh’s notes below, we actually didn’t want to show much in the way of gore, but we still wanted it to be horrific. As I’ve said multiple times before, Josh was the key to that. 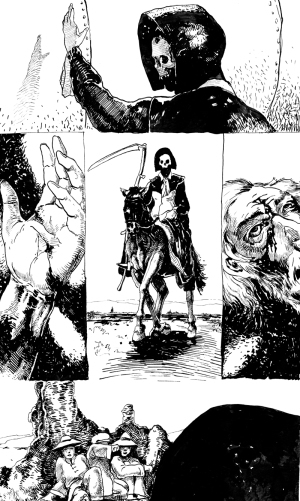 His art is simply unsettling but also beautiful, especially when looking at the actual line art (I’ve been including the uncolored line art in each page’s notes so you can really see the effort Josh is putting into this story). Because the “script” I gave Josh was actually drawn layouts, I did have some control over how things could be shown––though I must be clear, Josh was given full reign to reinterpret these pages as he saw fit. I figured closeups would be the best bet if only because it causes the reader to really look around and figure out what it is they’re looking at. If you show a severed hand with bone nubs and spurting blood, the thing your brain registers first is “gore.” But if you show a close up of a hand, or of a face, the first thing the brain processes is “hand” or “face” and then it has to figure out what’s going on around it. The reader is, in a sense, forced to ask, “What does it mean?” If that’s too much to ask of a reader, then fine; at least it looks awesome. “Save the Bones” wraps up on Thursday––yes, we will still provide an update on Thanksgiving Day––and then it’ll be relative radio silence on the website until Long John starts updating again in what looks like will be late January 2015. I didn’t want this page to be gory by any means. I don’t find horrific gore to be that amusing anymore. In my early comic-reading days, that was all the rage; being uncensored and edge was really getting pushed onto readers. [Editor’s note: He’s talking about early to mid-nineties comics, especially those published by Image comics.] With all the wars in the world going on right now and the atrocities to innocent people, I didn’t feel the need to push the gore factor. In an earlier conversation with Daniel [Editor’s note: Josh is one of the only people allowed to call D. Bethel “Daniel”], Jackie was just removing a blight on her land…that was all. Like spraying ants and spiders with pesticide. She is removed from the damage she is causing. I wanted to show the rot leaving the bodies, not their blood or hacked body parts and severed limbs.